Your wedding day is the most important day of your life, and of course, you want everything about it to be amazing. You have everything set for the wedding ceremony: the church, the decorations, your vows, and all that goes into making this a very special day. Now that you know where to buy wedding day sparklers and have ordered enough for the ceremonial first walk together as husband and wife, you think you have it all covered. Not so fast; how much thought have you given to the reception? What do you have planned to make it just as memorable as your ceremony? Did you know you can use our wedding sparklers indoors as well as outside? This is because our wedding day sparklers are virtually smokeless by design. Now let's take a look at that reception you think you have all planned out. The guests have all arrived, they have had their meals, and the toasts have all been made. We all know what comes next. The music starts, the guests all head out to the dance floor. While they are headed to the floor, each of your guests is handed a wedding sparkler. The sparklers are to be lit when the bride and groom come to the floor. Can you dream of a more magical and romantic addition to your first dance? Imagine dancing in the sparkling light provided by our 36-inch long wedding sparklers. These sparklers burn for approximately 3.5 minutes, giving you plenty of time to enjoy being in each other's arms dancing the night away. Your guests can form an archway around you, creating your own private space in the crowd. Alternatively, you can invite your guests to dance with the happy couple using the wedding sparklers as a way to illuminate the dance. To make it even more magical, why not turn the lights down and have the DJ mute his colored light show so that the only light for your first dance is that coming from the sparklers! 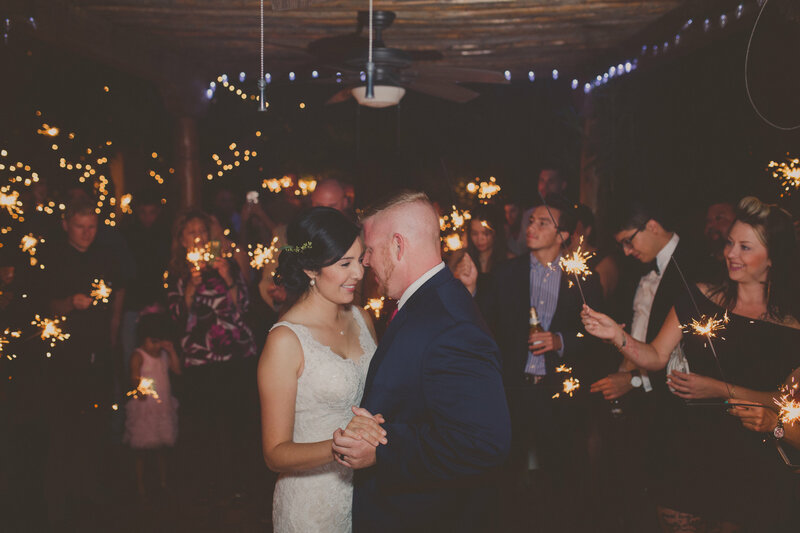 After your first dance, you can include wedding sparklers in many of your photographs. We carry heart-shaped wedding sparklers that are perfect for use in pictures including the happy couple, the wedding party, and family members. Since our wedding sparklers are virtually smokeless, your photos will come out beautifully. As a final farewell, make sure each of your guests has one more 36-inch sparkler they can use to form a long, illuminated pathway for you to make your escape into your new life and of course, go on your honeymoon together. If you are trying to decide where to buy your wedding day sparklers, we invite you to check out our selection of top-quality wedding sparklers at Wedding Sparklers Outlet. We offer bulk packs to save you money, wedding sparkler tags, buckets, and everything you need to add that final touch of magic to your special day.